I have pet rabbits so I watch the products I purchase; I do not buy something if it has been tested on animals. At one time Whole Foods was the best place to purchase the above since they had the Whole Body section. None of the products in this section were ever tested on animals. Whole Foods has changed their policy. The company still has the Whole Body section but now they are selling pets as meat, the pet meat is rabbit. To most people this would not make a difference; they would probably pass right by without another thought. 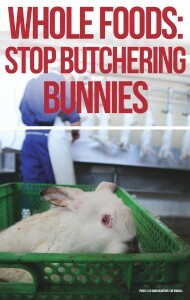 As a person who thinks bunnies are better than sliced bread this is disgusting to me. I walk into a store that I think is pet friendly for weekly groceries and then see the carcass of a beloved pet for sale, to eat!! Honestly, if it were the carcass of a dog, cat or horse, you would feel the same way. Rabbits are pets. Rabbits are the third most popular pet in the USA. It is estimated there are between 6-9 million pet bunnies in the USA. Yes, you read that correctly 6-9 million. I have two of those 6-9 million; one is stretched out near my feet, the other is currently hopping through the house, making her nightly check on everything. Rabbits are companion animals. They are able to learn their name, beg for treats, offer nose bumps to dogs, cats and even humans. I cannot walk into my kitchen without two bunnies sitting in the door way looking for something special, it does not matter if it is a single raisin or a little sip of sweet tea. When an animal acts like this, they are not something that should be on your supper table. 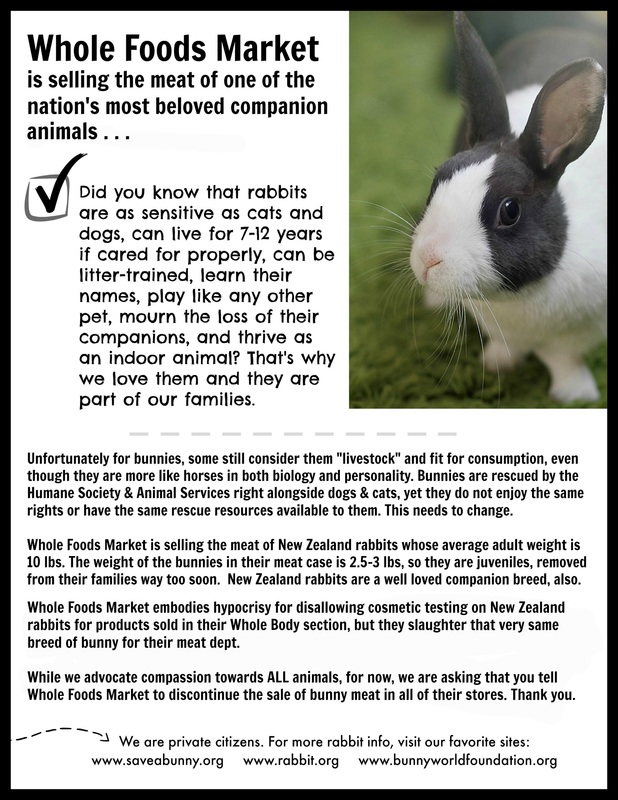 The House Rabbit Society along with all bunny rescue organizations in the USA and some International organizations have gotten together to stop Whole Foods from selling rabbit meat. For more information about or to join the cause please check out this post at House Rabbit Society or this one at SaveABunny. For more information connect with the Rabbit Advocacy Network. Currently over 70 businesses have signed the petition supporting this so we are not alone in our outrage. It is not just businesses supporting this. Check out this tweet from Sharon Osborne. She is supporting our decision. Consider retweeting her or writing your own tweet. 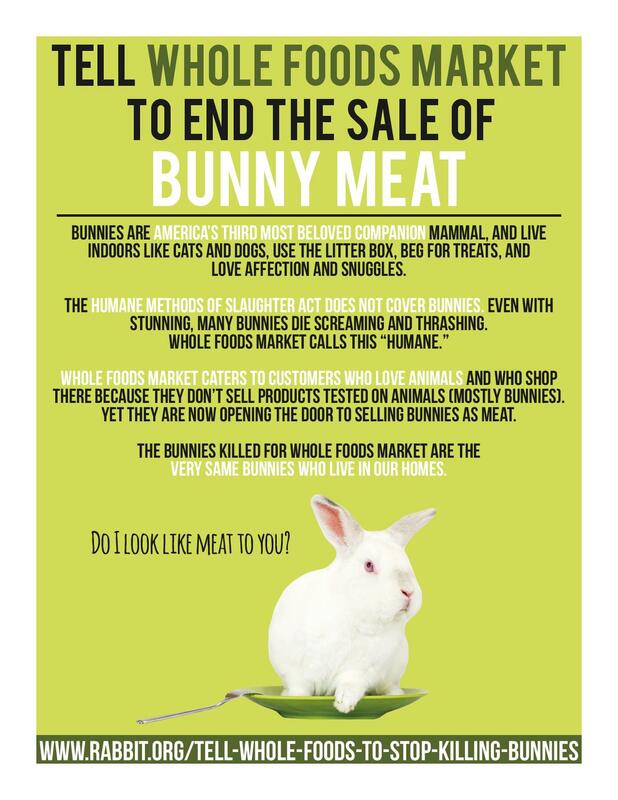 If you are brave enough I suggest reading How Whole Foods’ Bunnies Are Killed at House Rabbit Society. I read through two paragraphs before I was physically sick. After you read the article if you feel moved to act please consider signing the Change.org petition. One has to wonder what is next. Will Whole Foods start selling horse meat? Dog? Cat? All the while stating that customers demanded they sell the product. Below are some tweets from bunny lovers. Consider retweeting by clicking on the date. Together we can stop this!